WSSC water tank on Aqueduct Rd. The WSSC will be upgrading its water mains along Aqueduct Road in Rockville between Chilham Place and Old Canal Road this winter. To reduce the impact of water loss on residents, the utility will be performing the work at night, between 9:00 PM and 5:00 AM. The project will take several nights to complete, and will take place this month or possibly into March, depending on weather conditions. 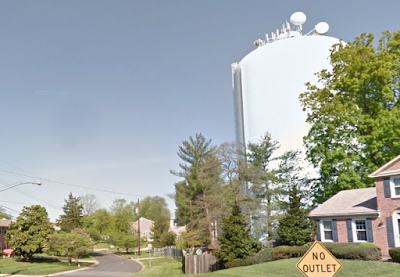 As you may know, the WSSC has a large standpipe water tank on the next block, at 8505 Aqueduct Road, so these are likely large and important water connections underneath the road. "WSSC has a large standpipe water tank on the next block, at 8505 Aqueduct Road." 9:18: Yep. You must be feeling pretty stupid right now. It's in the picture, moron. Moron. Dumbass. You sure do have the temperament for elected office.